SINGLE-MINDED devotion to Carnatic music — that sums up Bhushany Kalyanaraman. Hers is an extraordinary tale, spanning oceans. Born and brought up in Colombo, Sri Lanka, it was a typical Tamil household where her father used to ensure that everyone was awake at 5 a.m., reciting the Tiruvempavai. A renowned musician, her father had won the title “Sangita Bhushanam” from Annamalai University. All her sisters too sang well. Love of Carnatic music brought Bhushany to Chennai, at 16,to stay and study music at the Government Music College. She went back to Sri Lanka, to teach music at a Jaffna college. The riots in 1982 brought her back to India, drawn by her deep admiration for her subsequent guru and husband, Tanjore S.Kalyanaraman, senior disciple of the legendary G.N.B. A congenial atmosphere prevailed in her marital home, with a very supportive mother-in-law. “My husband was totally immersed in music much of the time,” recalls Bhushany. “He never took any fee from his many students, he was a very stern man, a strict taskmaster, and a perfectionist. His family was quite well to do, which allowed him to concentrate on music. A veritable genius as a vocalist, he even had many senior musicians coming to him for guidance. He has been my only guru, after my father. I’m what I’m today only because of him,” says a nostalgic Bhushany. 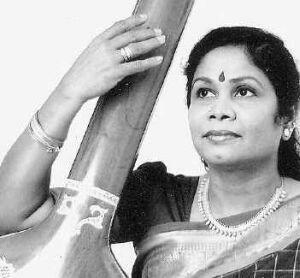 Sadly Kalyanaraman passed away a few years ago, leaving a big void in the music world, and in Bhushany’s life. Today Bhushany is an Indian citizen; so much at home is she in India. “I’ve been all over the world, except Russia. I like it best here. I stay abroad for two-three months, to teach and perform,” says Bushany. A Sri Lankan nation ever appreciative of Tamil culture and Carnatic music has honoured her with “GANA RATNA”. Sri Lankan organisations in London have had her sing for fund raisers in 2001 and 2003. Bhushany is a fortunate person — she has the best of both Sri Lanka and India, the best gained by besting life’s many odds. “Bhairavi, captures moments in the flux of human experience, denoting majesty (gambhiram), seriousness now and peace and bhakti at another moment. It has the power to offer deliverance from current difficulties and protection against those of the future. In worship and especially in fulfilment of a vow, I intentionally sing this raga summoning forth help from without and within,” says Bhushany Kalyanaraman, who has had her training from stalwarts such as Kulasegaran, her own father and all-time greats such as T.M.Thiagarajan and K.V.Narayanaswami. Bhairavi also brings forth special memories when she sings ‘Bala Gopala,’ Muthuswami Dikshitar’s chowkakala kriti with her illustrious husband Kalyanaraman sometimes at his pitch and sometimes at her own, understanding the nuances of the raga, its strong rishabh and the movement which brings out the whole range and atmosphere that is unique to Bhairavi.